Facebook can be a dangerous, if not a fattening, thing. How you ask? Well, last week I saw that Flavor Cupcakery would be presenting five candy bar themed cupcakes as part of a contest and my interest was automatically piqued. Then, I remembered my friend, Sarah, would be coming off a month long “candy fast” on September 1st, the same day that Flavor Cupcakery would have all five candy themed cupcakes. The wheels in my head started working and I asked Sarah if she would be interested in having a girls night featuring these cupcakes as a way to break her fast. Crusader Jenn was also included in our evening festivities, but unfortunately Crusader Elisa was out of town for the holiday weekend. After a gluttonous dinner of cheesesteaks and french fries (we decided to go all out this evening…) we started in on the cupcake tasting. This was the first time Sarah had joined us for a “Crusader Tasting” and I think she thought we were nuts got a kick when we started taking notes. We take cupcake eating very seriously. The M&M’s sparked our curiosity the most because for a chocolate candy, the cake and frosting seemed to be vanilla based; however, the surprise was in the center. Flavor Cupcakery took the idea of a candy coated chocolate literally so that the cupcake and frosting represented the candy coating and inside was a milk chocolate filling. 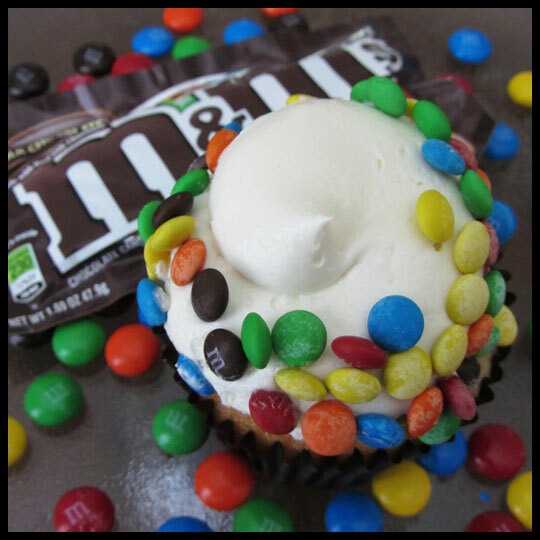 With the crunchy mini M&M’s on the rim of the frosting, this cupcake really tasted like an M&M’s candy. The cake was moist and the frosting just sweet enough with the addition of the sweet little candies, making this a very enjoyable cupcake. 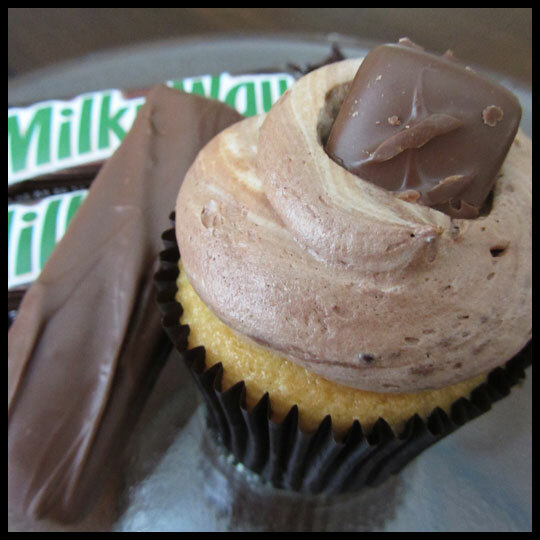 The next cupcake on our list was Milky Way. Unfortunately this cupcake didn’t wow us like the first. I wasn’t a fan of the milk chocolate frosting (but that’s not a hit against Flavor Cupcakery, I have just never been a fan of milk chocolate frosting) and Jenn didn’t think the caramel had a good flavor. Then, with the cake being vanilla, it didn’t really convey the feeling of a chocolately Milky Way bar. Slightly disappointed, but already starting a sugar high, we moved onto the Ferrero Rocher cupcake. 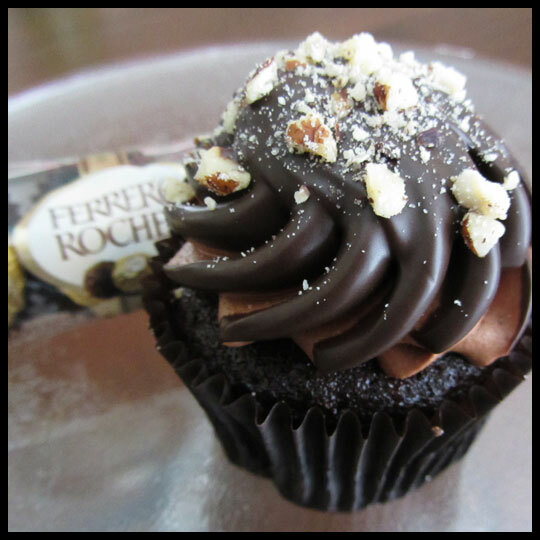 I was most excited about this cupcake because I LOVE Ferrero Rochers. There is something about the crunchy outside and gooey inside that makes me want to do a little dance. While this cupcake was over-the-top decadent, we agreed that the hazelnut flavor wasn’t present enough to really make this candy bar themed cupcake successful, however, its overall flavor was so rich and wonderful that it was still a favorite of the evening. 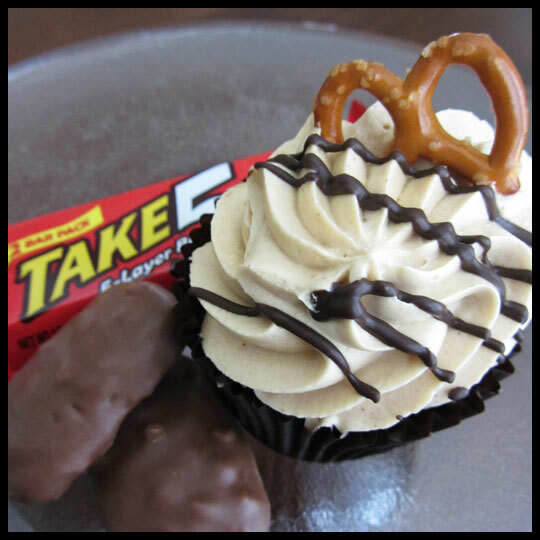 The Twix cupcake had mixed reviews. Jenn, who wasn’t a fan of the caramel filling, didn’t think it represented the candy well and that the chocolate cake overpowered the other flavors. I agreed with this slightly, but thought that the cookie bottom was a nice touch and added a good texture to the cupcake. 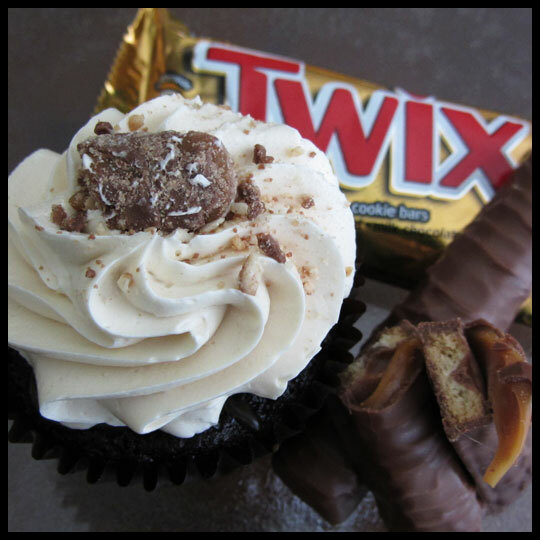 Again, it was another tasty cupcake, but slightly missed the mark when it came to representing the true flavor of a Twix candy bar. Being big fans of the salty/sweet combo and Take 5 candy bars, we saved this one for last. The peanut butter frosting combined with the caramel filling, chocolate cake, and pretzel crumble bottom, really worked well together. While the pretzel got a bit soft due to the moisture of the cake and frosting, the flavors in this cupcake were still spot on. The only other downside to this cupcake was that the pretzel base didn’t hold together well, so it was hard to get the pretzel bits in one bite with the cake and frosting. But this was still our favorite of the group and we voted for it in Flavor Cupcakery’s contest. 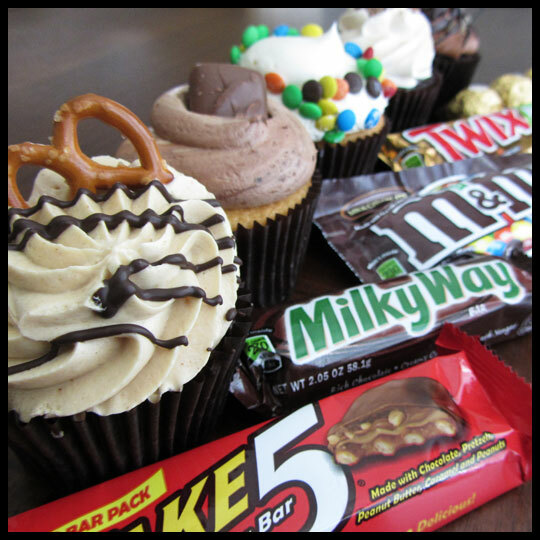 Our final thoughts are that these are some of the best cupcakes we’ve had from Flavor Cupcakery, even if some were not true representations of the candy bars they mimicked. Each had moist cake and smooth buttery frosting and were a great addition to a junk food fest girls’ night. If you didn’t have a chance to try these cupcakes, follow Flavor Cupcakery on Facebook to find out the winning flavor because they will be featuring it on the fall menu as a regular item. 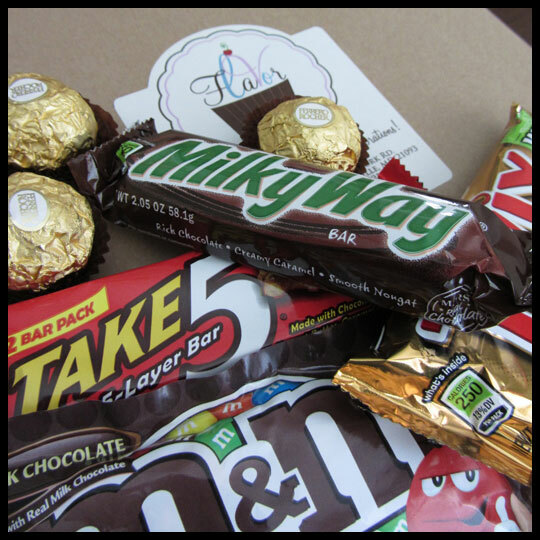 This entry was posted in Cupcakes, Maryland and tagged Candy Bar, Cockeysville, contest, Cupcake, Ferrero Rocher, Flavor Cupcakery, M&M's, Milky Way, Take 5, Twix by Stacy. Bookmark the permalink. YUM! Too bad the Milk Way and Twix one weren’t as good as you thought they’d be. They sound like they’d be yummy!